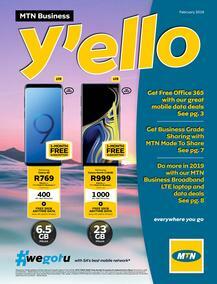 MTN is a global communications provider which was established in 1994. MTN primarily focus on connecting the African continent and believe that through access to communication, people are empowered. MTN is made up of three business divisions, namely MTN-SA, MTN International and Strategic Investments. The group is also listed on the JSE under the Telecommunications sector. MTN has approximately 152 million subscribers and has operations in 21 countries over Africa and the MIddle East. 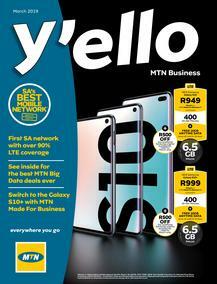 MTN also enjoys about 37% market share in SA and 60% of the SA population are covered by their 3G network technology. Calling and voicemail services: These services include voice mail, call back, call barring conference calling, dual calling emergency calling and more. 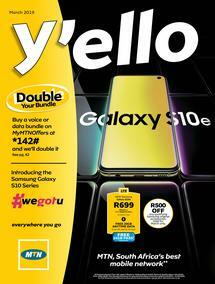 They also provide a massive range of phones and devices to fit any budget, whether you are in the market for a smartphone, feature phone or other, MTN will have a device for you. 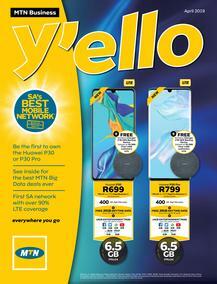 MTN also provide their customers with prepaid or contract cell phone packages. Messaging services: MTNs messaging services include Text messages (SMS), picture messaging (MMS), Email2SMS services, Faxmail and Blackberry services. Internet: MTN brings the internet to life with a wide range of packages and bundles for customers to choose from. People can choose between 500MB, 1GB, 2GB, 5GB, 9GB or 18GB packages and they also have a whole bundle of smaller internet bundle packages to fit any budget. MTN also provide a range of devices for users to connect with, whether you are looking for laptops, tablets, modems, 3G or other- MTN will have it all. MTN’s main focus areas include Education, health, economic empowerment and national priority areas. They also aim to spend about 200 million rand by 2015 to improve education across all markets. 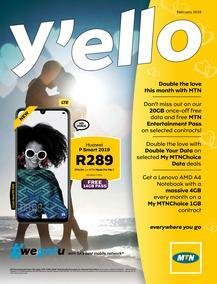 A wide range of MTN specials and great deals are available throughout the year, this includes specials on pre-paid and contract packages, MTN data deals, device specials and many more. All available deals are showcased on Guzzle via their MTN catalogues, so keep your eyes peeled for that special deal for you! Address: Shop 20,Khayelitsha Shopping Centre,Walter Sisulu Drive,Khayelitsha. Address: Shop 18b, Wamakers Plein Shopping Centre, Fabriek Street,, Paarl. Address: Shop 134a, Vaal Mall, Rossini Boulevard,Se2, Vanderbijlpark. Address: Shop 2, Voortrekker Street, Vereeniging. 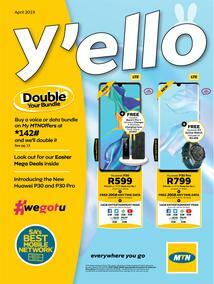 Address: Shop L06,Trade Route Mall,Cnr Nirvana Drive & The K43 Highway,Ext 9,Lenasia. Address: Shop 51, Kagiso Mall. Cnr Kagiso Street And Randfontein Rd, Kagiso.